WSO2 Complex Event Processing Server Development team has released the Alpha version of WSO2 Complex Event Processing Server early January 2011. 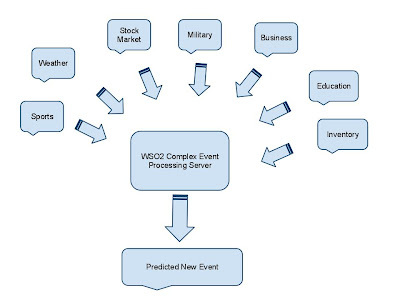 What is WSO2 Complex Event Processing Server ? WSO2 Complex Event Processing server acts same as other CEP Servers on processing events and generating new events on analyzing incoming events from multiple sources. 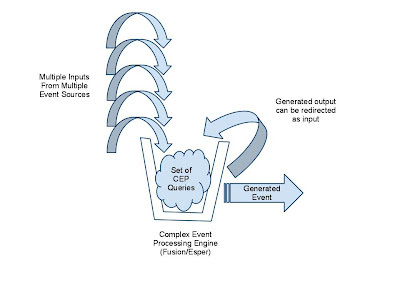 As you can see in the above diagram , Any Complex Event Processing Server can receive any number of events from any number of event sources. What the CEP Server does is analyzing the content of the receiving event and identify the meaningful events from the receiving event cloud. When multiple events matches with a query specified by a user of the server, it creates a new event indicating the satisfied conditions. How WSO2 CEP Server is different from others ? 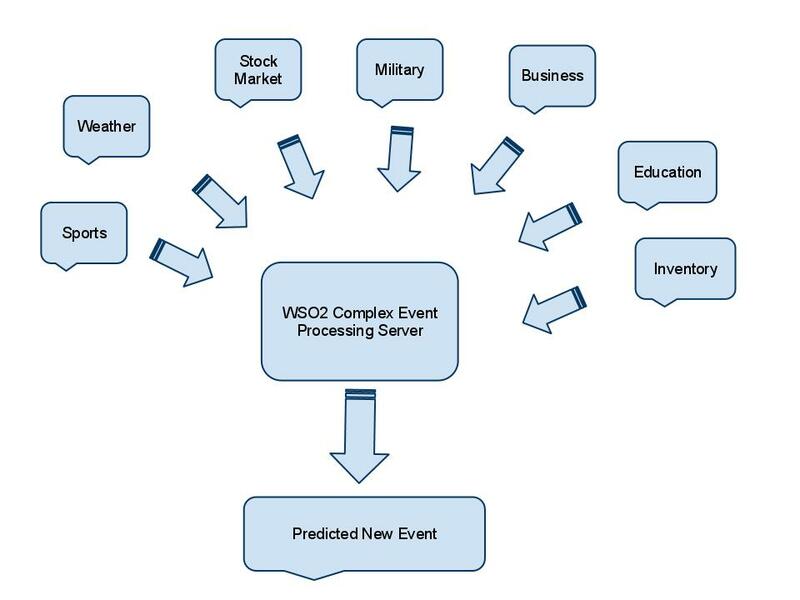 WSO2 Complex Event Processing server introduce Complex Event Processing to SOA World. We have complex event processing servers in standalone mode. Here WSO2 is providing the users to use Complex Event Processing Engines as Web Services. So any user is not needed to have there own server running on their premises to use Complex Event Processing feature on the events received. What he need to do is access a web service providing Complex Event Processing Service by WSO2 Complex Event Processing Server. What is the Event Processing Engine Running in WSO2 CEP ? WSO2 Complex Event Processing Server is Running of Drools Fusion Complex Event Processing Engine and it is embedded to the server. Apart from that it is very easy for the user to add the Esper complex Event Processing Engine to WSO2 CEP Server. It is a matter of installing the Esper Feature on WSO2 CEP Server. What is the basic concept used in WSO2 CEP Server? In WSO2 CEP Server is developed by WSO2 CEP Development team with the Concept of 'Bucket' to be used in the entire server. Actually a Bucket is an instance of a Complex Event Processing Server. So when a particular user creates a bucket means, he creates a separate instance of a CEP Engine for him. Here is the Concept in WSO2 CEP Server..
Can I play with this release? What do i have to know to deal with this? You are not needed to have a huge knowledge on Complex Event Processing to deal with this WSO2 CEP Server. All the basic things used in this server has clearly explained in the User Guide of the documentation of this server. It will be an added advantage if you have knowledge on Complex Event Processing and Writing queries with ESPER , and DROOLS Fusion Complex Event Processing Engines.